The Dow Jones Industrial Average (DJIA) got within 13 points of 20,000 last Tuesday. It finished the week about 90 points below the vaunted milestone. 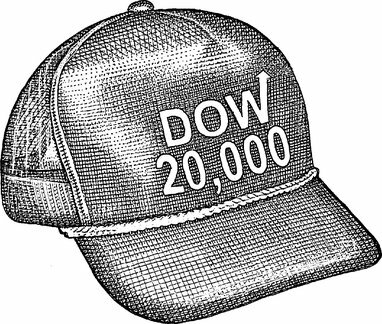 As a result, the Dow Jones has gained nearly 10 percent since the end of October, more than double its 4.1 percent rise during the first nine months of the year, spurred in part by Donald J. Trump’s victory in the 2016 U.S. presidential election. On the other hand, profitability has improved. As a result, american companies have seen earnings rebound, and many companies are positioned to benefit from the corporate tax cuts promised by the new administration. However, this good news may already be reflected in current share prices. Robert Shiller’s cyclically adjusted price-earnings (CAPE) ratio, a measure of valuation based on average inflation-adjusted earnings of companies in the Standard & Poor’s 500 index from the previous 10 years, was at 27.99 on December 23. That’s almost 70 percent above its long-term average of 16.05 and indicates markets may be overvalued.